I am very happy to have the opportunity of using your pianos for my concerts. I consider them to be perfect in every way. —Portraits of Musical Celebrities: A Book of Notable Testimonials. New York: Steinway &amp; Sons, 1922. Steinway grand pianos are crafted by hand, which is why it takes 11 months or more and countless hours of fine-tuned labor to make one. The process—a feat of engineering, a magical alchemy, or both—involves hundreds of skilled cabinetmakers, craftspeople and gifted tuners. Tippet Rise is home to a treasure trove of Steinways: a dozen of them, each extraordinary and each with its own nuances and attributes. These essays, written by the Art Center’s co-founder, Peter Halstead, explore them. 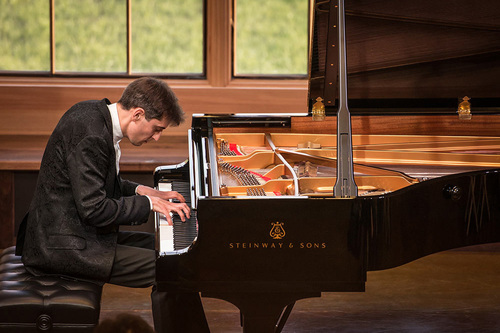 A nine-foot concert Steinway has over 12,000 parts. Its strings are under twenty tons of pressure. So it has an effect immeasurably beyond its size, as big as it is. It is a church organ in disguise. Although each piano is made in exactly the same way by the same people, each one is completely different. Each piano has its own DNA. 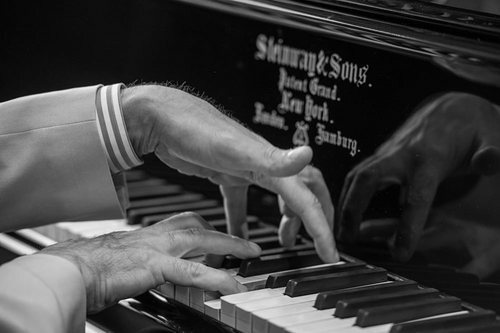 Always the finest and most harmonically complex of all piano brands, Steinway & Sons in New York has perfected its progeny steadily over the last few years. The density of the felt used on the hammers has gradually been increased to nearly what it was on Anton Rubinstein’s piano during the great era of humanism in music. The company has finally adopted the more flexible parts used by their German branch, to universal acclaim. So the great pianos are not only the ones from the 1930’s or the 1890’s, but from 2015, and at Tippet Rise we have two of those. Two others date from 1897, shortly after the invention of the modern Steinway. Their sound is like Proust’s madeleine, evoking a relatively more meditative world, where instruments were almost human, walls burled with Circassian walnut wainscoting, and drawing rooms produced sounds like the inside of a violin, multiple layers of aged wood resonating around the divine ratios of an architecture which still remembered the Parthenon, where music meant a soirée in a rococo jewelbox specially designed for it. The filigree, the moldings, the niches were not just decorative but today would be called absorbers, diffusors and reflectors, clever shapes to deflect and augment the many frequencies which have to arrive simultaneously or variously at the ear in order to move us. We have a Hamburg D from the Konzerthaus in Vienna, which was last played by the celebrated Soviet-Austrian pianist, Elisabeth Leonskaja. Her ethereal Schubert sonatas, seeming to float above the audience, were the reason we contacted Arup Engineers to design a hall for Tippet Rise similar to Snape Maltings, where we had heard the numinous Leonskaja play. This resulted in the Olivier Music Barn. The pianos I grew up listening to were from the 1940’s. They had a lush, burnished sound, like Burgundy wine. We wanted a piano like that for Tippet Rise, and Tali Mahanor, the resident piano expert of the Chamber Music Society of Lincoln Center, happened to have the one. She restored every part of it—actions, repetitions, case—and she provided historically accurate piano stands and legs. CD-18 (“CD” for “Concert Department”) is an extraordinary instrument with a story to match: This was Vladimir Horowitz’s personal piano and it is the piano Eugene Istomin played, with the Philadelphia Orchestra under Eugene Ormandy, for Columbia’s 1956 recording of Sergei Rachmaninoff’s Piano Concerto No. 2 in C Minor, Op. 18. More of CD-18’s story is here. For additional insight on the making of a Steinway piano, see “Note By Note” the feature-length independent documentary that follows the creation of a Steinway concert grand from the forest floor to the concert hall. CD-18: "The Greatest Piano of All"
Columbia wanted its own Rachmaninoff Second, with the Philadelphia orchestra under Eugene Ormandy. And the soloist should be Eugene Istomin. For this recording, Istomin wanted an exceptional piano, and Steinway had one. It was CD (for “Concert Department”)-18, and it was Vladimir Horowitz’s personal piano. On this instrument, the key dip was shallow, which allows very rapid fingerwork and quick, light accenting, and the sonority and dynamic range were exceptional. When Horowitz was not using it, CD-18 was locked up in the basement of Steinway Hall, and only Horowitz could touch it. For years, CD-18 was the centerpiece of a musical world that included Istomin, Horowitz, Ormandy, Leonard Bernstein, Rudolf Serkin, David Oistrakh, and the great Istomin-Stern-Rose Trio, which united Istomin with violinist Isaac Stern and cellist Leonard Rose. Istomin had married Marta, the widow of the legendary cellist, Pablo Casals. Together, they ran the famous Festival Casals de Puerto Rico. Marta later became head of the Kennedy Center in DC, and was recently honored as a Living Legend by the Library of Congress. After Istomin died in 2003, Marta put CD-18, the source of so much joy and wisdom, into seclusion, hoping for the right suitor. Years later, Marta and Eugene’s lifelong friend and tuner, Tali Mahanor, the resident piano expert of the Chamber Music Society of Lincoln Center, helped Marta decide that CD-18 needed to be resurrected in a place that would give it the love and the attention it had attracted in the formative decades of the ‘50s and '60s, when Europe’s great musicians sought refuge in a newly-optimistic post-war America and incidentally shaped its musical identity. And so CD-18, newly restored by Tali, has emerged at Tippet Rise where we know later generations will prize its lushness and its brilliance, as did the legends of American music.